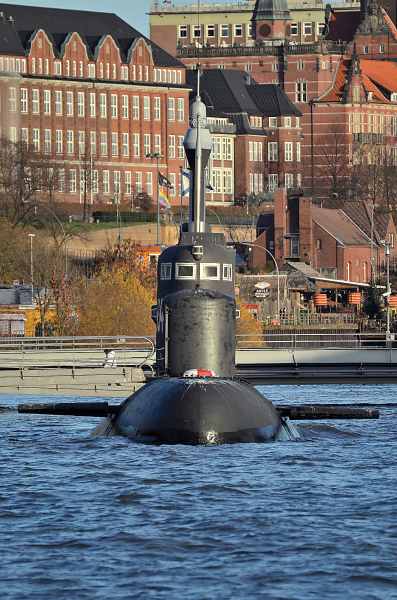 U434 Museum Submarine (ex B-515) at Hamburg, Germany. A real sunny day...but cold, at Hamburg. Propulsion: 3 diesels delivering 6,256 shp (4,665 kW) with 3 electric motors driving 3 shafts. Armament: 6 × 533 mm (21 in) bow torpedo tubes. 24 × 533 mm (21 in) anti-submarine and anti-ship torpedoes or equivalent load of mines. This photo has been shown 1,046 times since it was added to the site.